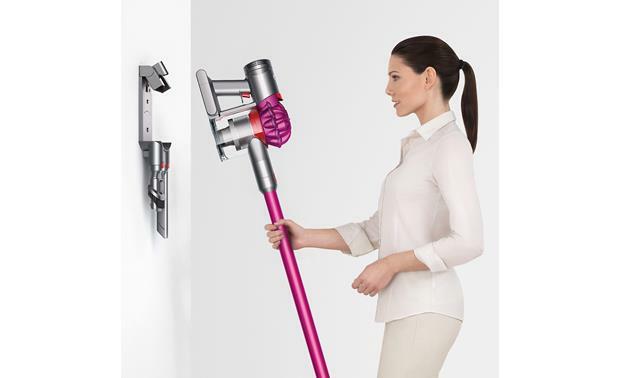 Dyson's V7 Motorhead offers incredible cleaning power without the hassle of a traditional corded vacuum. 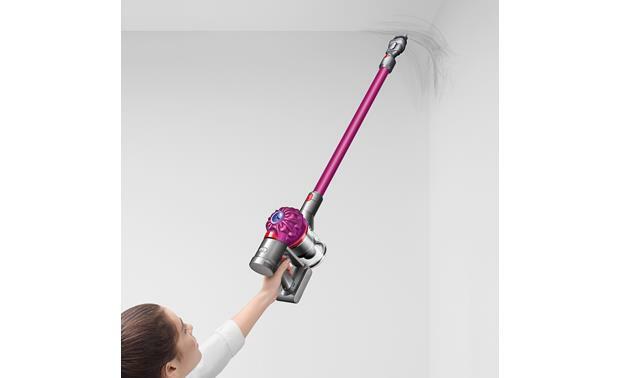 Dyson's V7 Motorhead offers incredible cleaning power without the hassle of a traditional corded vacuum. Its lightweight frame makes using it around the house a breeze. And its built-in rechargeable battery gives you up to 30 minutes of juice. The V7 even pulls double duty — quickly transforming into a handheld unit for your car, garage, or camper. 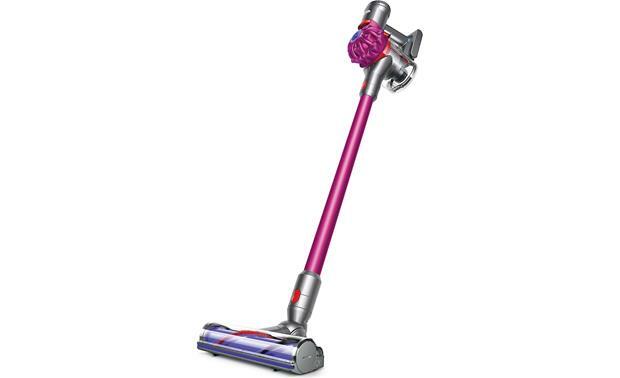 Dyson has spent decades refining its vacuum technology. The result is a powerful cord-free unit that can tackle all sorts of messes. The V7 is ideal for dirt, dust, food, and even pet hair. 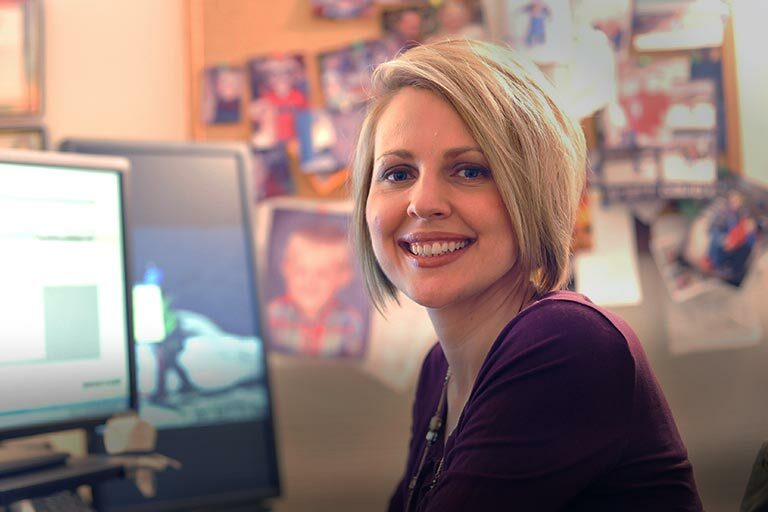 Its 'max mode' button kicks it into high gear to tackle the toughest jobs, like thick carpets with ground-in dirt. 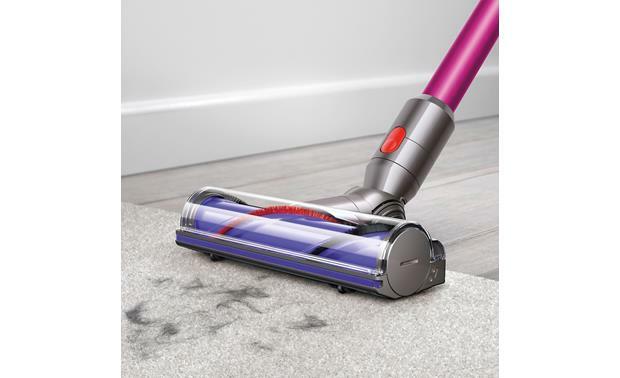 The Dyson V7 Motorhead comes with a direct-drive cleaner head that works wonders on carpets and hardwood floors. 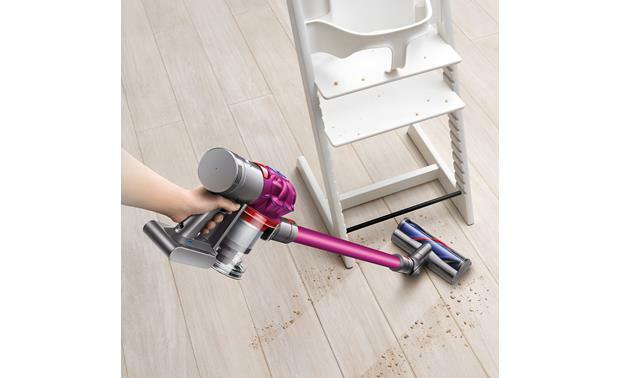 Overview: The Dyson V7 Motorhead is a cordless vacuum cleaner with powerful suction (100 air watts), and 75% more brush bar power than the Dyson V6 Cord-free. 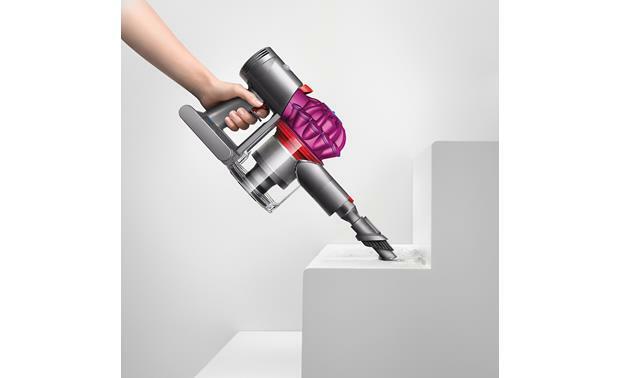 It is powered by the Dyson digital motor V7, and comes with a direct drive cleaner head, a combination tool, and a crevice tool. You can easily switch from a floor unit to a hand-held in seconds. The V7 Motorhead weighs only 5.45 pounds, and is powered by a 21.6 volt rechargeable battery. A wall-mounted charging dock is included. 2 Tier Radial Cyclone Technology: The V7 Motorhead uses Dyson's patented cyclone technology in which powerful centrifugal forces spin dust and dirt out of the air and into the bin. A total of 15 cyclones, arranged across two tiers, work in parallel to increase airflow and capture fine dust. Battery: The V7 Motorhead cord-free vacuum is powered by a powerful 21.6 volt Lithium-Ion rechargeable battery. A fully-charged battery delivers up to 30 minutes of fade-free suction, up to 20 minutes with the motorized floor tool attached. When switched to Max Mode (see below), the battery life is reduced to 6 minutes. Docking Station: The V7 Motorhead features a convenient wall-mountable docking station for storing and charging the machine. When the unit is docked, a fully-exhausted battery charges in approximately 3.5 hours. Operating Modes: There are two operating modes: Powerful Suction and Max Power Mode. The Powerful Suction mode should be used for general cleaning and for extended battery life. For more difficult tasks, you can slide the top-mounted switch to Max Power mode for up to 6 minutes of higher suction. Dirt Ejector: The unit has a clear dirt bin with a volume of 0.14 gallons (1.12 pints). When the debris in the bin reaches the MAX level, it can be easily emptied in a single motion. Pulling up the top-mounted red lever pulls up the motor and releases the door, allowing the dirt to be ejected through the bottom of the bin. After emptying, the motor and the door click back into place. Direct Drive Cleaner Head: The Direct Drive cleaner head is designed for carpets. The stiff nylon bristles remove ground-in dirt from carpets, while the carbon fiber filaments remove fine dust from hard floors. 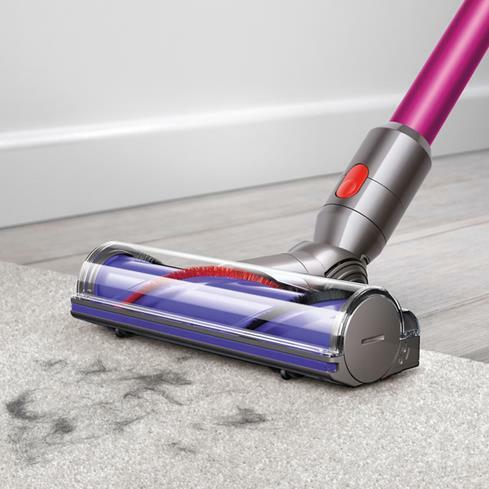 The direct-drive cleaner head drives the bristles deep into the carpet for better results. The bristles cover the full width (8-3/4") for edge-to-edge cleaning. The head is only 2-5/8" high which gives good clearance under furniture. Quick-release Combination Tool: The non-powered Combination Tool is ideal for quick cleanups. It has a 2" x 1" nozzle with long bristles you can slide and lock into place when needed. The nozzle and bristles are at a 45° angle for better coverage. This tool works well for cleaning up high. Searches related to the Dyson V7 Motorhead High-performance cord-free handheld and stick vacuum cleaner.